Sue: "Wow! You've lost weight since I saw you last!" and gain some weight before Christmas." Remember "Santa?" He was one of the first NOBO thru-hikers I met in the spring. I saw him at least three times, and posted a photo of him with two younger hikers at a shelter in this journal (Day 13). I haven't seen him since the end of May. Santa (AKA Jim from Pennsylvania) was one of many hikers who got ahead of me in July when I was off the Trail so many days. Since I last saw him he partnered up with another retired fella, "Bigfoot," and I've been seeing their comments in the trail registers for several weeks. It was fun to finally catch up to him today! Santa was at the last shelter I passed, right along the Trail. Two shelters were practically sitting on the Trail today, making it very easy to sign the registers without doing bonus mileage. Since I've been finding registers on trees in recent states I seldom go off-trail to shelters any more. Santa knew I was coming behind him; two other hikers I'd walked with today had been with him at the shelter last night. They beat me to the Story Spring shelter and told Santa I'd be there shortly. I got a hearty welcome hug from the now-skinny Santa. Not that he was overweight before; he's just really toned now and looks great, not gaunt like some of the younger hikers who need more calories. And he's lovin' the Trail. Like many other thru-hikers he's got his routine down pat and is putting in 17-18 miles a day now. He's happy to see his family every few weeks and calls his wife almost daily (I remember him telling me the first time I met him that she worries about him and wants a daily call). 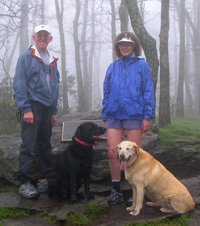 Santa and his bride recently celebrated their 30th anniversary along the Trail. Santa was thrilled yesterday afternoon when his two young grandsons, age four and six, hiked about two miles up from VT 9 to see him at the Nauheim shelter. The kids are totally fascinated with all of Grand-dad's trail stories. What a great role model he is for his family! You know, today I almost didn't even get on the Trail. It took more courage for me to get out of bed and ready to run/hike today than any previous day of this adventure run. I was facing a 22-mile roadless stretch of Vermont wilderness with no bail-out options in case of an emergency. I knew what yesterday's section was like, with all the rocks, roots, boulder climbs, tough descents, and bogs with dilapidated puncheon. Horton's account of today's section indicated it was "trashy," a term he used to indicate slow, difficult running. The section also includes a lot of elevation gain and loss (about 5,000 feet of climb and 4,300 feet of loss). What really worried me, though, was the torrential downpour we got this morning between 1 and 2 AM. The thunder and loud, hard rain on the camper roof woke me up despite the ear plugs I always wear. I could even see the lightning through my closed eyelids! Two inches of rain fell, according to the news. In my sleepy state, when obstacles seem bigger than they really are, I conjured up all kinds of worst-case scenarios about the dangers of wet rocks, possible vertical rock climbs or descents, slick roots and mud, swollen creeks where I couldn't see the bottom, more broken and badly-canted bog bridges I would surely slide off. I remembered tales of flooded creeks that I've read about in hikers' trail journals and the difficulty Andrew Thompson had in the aftermath of one of last year's hurricanes - he stopped in his second attempt at the Trail record because of impassible creeks in Vermont. I was awful-izing big time in my sleepy state! When the alarm went off at 5:30, those thoughts were still in my mind. And it was still raining. I got up and re-read the information about the section, didn't see anything more alarming than possible problems because of beaver dams, and decided, "You weenie, just do it." I carried a second trekking pole for stability and took extra supplies in case the day turned into night on the Trail - Marmot rain jacket, flashlight, extra gel and water - in addition to the emergency supplies I carry daily. I hope it was my sense of adventure and desire to keep moving that propelled me out the door and not the non-refundable deposit on the next campsite that we'd reserved for tonight! I'm glad I battled my demons and they didn't win. Today turned out to be one of my best days on the Trail. It had stopped raining but was very foggy when I started up the long incline to Maple Hill (about 2,200 feet), Porcupine Ridge, and Glastenbury Mountain (3,748 feet, today's high point). I stopped to write some notes part way up, and a large tree limb cracked and fell about thirty feet behind me! One more thing to worry about, as the day was fairly windy. The morning fog reminded me of my first day on the Trail. You can tell from the Springer Mountain photo on each journal page that it was foggy there. Gosh, that seems so very looong ago! (Jim agrees.) I'm still excited to be out here, but I think I'll be relieved when I'm done. I'm three-fourths there now. I knew I was on Glastenbury Mountain when the trees changed around 3,200 feet from deciduous to spruce and balsam. Ahh, that lovely pine fragrance again! There was a tower on top that I climbed to get a 360-degree view, but even though the sun was out then, fog completely covered everything below me. Hence, no photo. The first eighteen miles of this section from VT 9 to the Story Brook shelter were absolutely gorgeous, even without views. Forests don't come any prettier than these, rivaling any I've seen out West. Much of it was above 3,000 feet. Although it was too rocky and rooty for me to run much, those who are less rock-challenged would love it. And it makes for a great hike if you're not in a huge hurry. 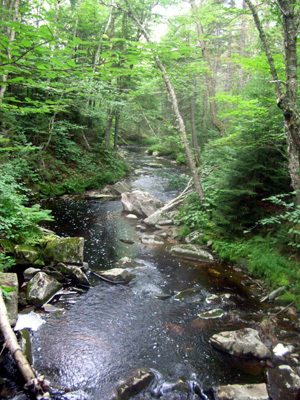 There were two pretty ponds in this section and several large creeks with real bridges over them (City Stream, Hell Hollow Brook, South Alder Brook, Black Brook, and Deerfield River), as well as several tiny creeks that were easy to cross. There were muddy spots, especially in the last four miles, but only a couple bogs with puncheon. Although I saw moose tracks and poop, I didn't see any more moose. I'm glad I had the nerve to get out there on the Trail today. I enjoy foggy trails; it's kind of dream-like then. I did slip and fall on a slick rock and had many near-misses, but hopefully no great harm was done. It was a fun day. Besides a beautiful course, the other great part of the day was seeing more thru-hikers than on any one previous day on the AT. What a bonanza. I also met several Long Trail hikers. 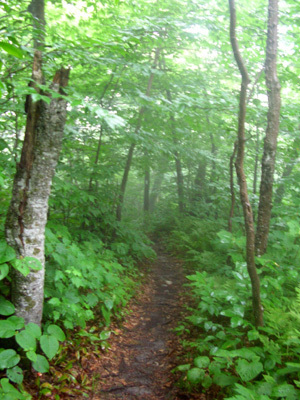 SOBO AT thru-hikers included "Strider," "Superfeet," "Yeti," "Dub," "Sock," "Charlie Tuna," and "Ragman." 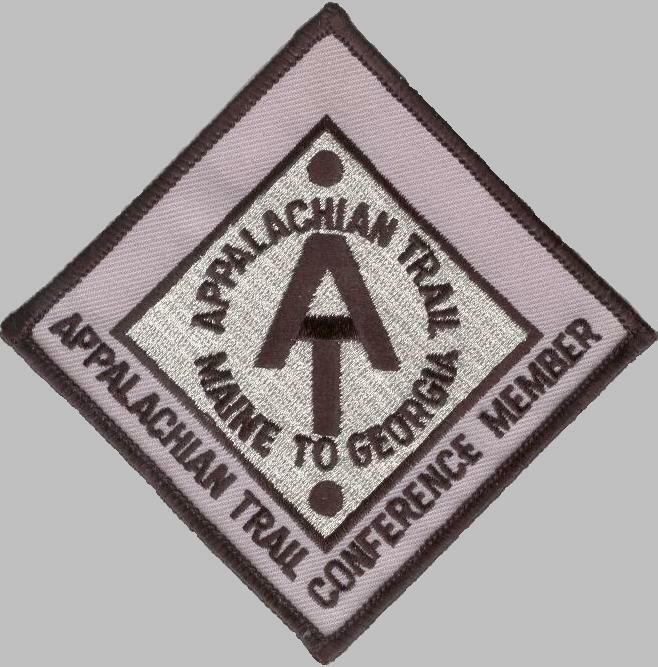 Ragman is doing a flip-flop; he hiked north from Georgia to Virginia, and now is hiking Maine to Virginia. I remember seeing him this spring. Superfeet has seen about twelve moose in NH and ME, but none all the way through VT. I feel privileged to have seen one yesterday. None of the NOBO thru-hikers I talked to today have seen any yet. Sock is a teacher from Indiana; he's on leave the coming school year. His friend, Charlie Tuna, lives in Asheville and does mountain bike races. They plan to hike the whole way together. When I talk with SOBOs, we exchange trail information like good spots to get water, trail conditions each direction, and where trail magic can be found - important stuff, you know! Two NOBO Long Trail hikers I talked with briefly are Bob and Sandra, a retired couple "practicing" on the LT to decide if they want to do an AT thru-hike someday. When I came up on them from behind I thought they might be "Buffet" and "Goat," another retired couple ahead of me on the AT that I met several weeks ago. Hopefully I'll see them again soon. NOBO thru-hikers included the afore-mentioned "Santa" and "Bigfoot," "Mother" (young fella whose trail name comes from the movie "Sneaker"), "Magic Touch," "Vogue," "Aslan," and "Godspeed." Jim met Vogue back in Harper's Ferry on the C&O Canal Path, but I don't think I've seen her before. Mother, Magic, Vogue, Aslan, and Godspeed were sitting next to an inviting campfire beside the torn-down Goddard shelter. The Green Mountain Club is apparently going to start rebuilding this shelter next week. I had the opportunity to hike with Aslan and his father, Godspeed (pictured above) and talked with them several other times when they stopped to rest or take photos. They have a great story! 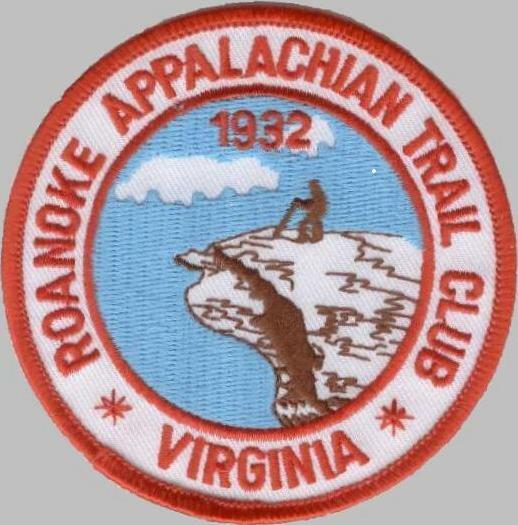 They began their thru-hike in Georgia in 2002 but had to stop in Virginia when they discovered Aslan, then only eighteen, had a brain tumor. He wasn't expected to live but he has recovered and is back out on the Trail with his dad. 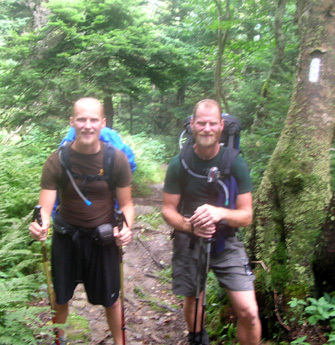 They began in Virginia (we remembered seeing each other on Dragon's Tooth, near my home town of Roanoke) and they will finish in a few weeks at Katahdin. Speaking of sponsors, three other hikers today were wearing Montrail Hardrock shoes like me - Aslan, Santa, and one of the Long Trail hikers. They are becoming very popular with backpackers who don't like hiking boots. Santa said he put 800 miles on one pair of Hardrocks. Jim had a good day. He slept some more after taking me to the trail head, went to the library in Bennington, and saw many of the fifty-plus Moose Fest moose displayed around town (see Day 108). He moved the camper from that great boon-docking site off Vermont 9 and found another great one for tomorrow night on up the road. He also checked out the area around Arlington, where we are camped tonight, and found another pretty covered bridge. There are loads of those in Vermont. Tonight we got to enjoy about 30 minutes of patriotic songs played by a local fife and drum corps who are practicing for a large parade tomorrow in Bennington. We are camped around a large grassy area where the band played. I could hear them while I typed this entry and Jim sat outside and enjoyed the cool Vermont evening with our camper neighbors. Perfect end to a near-perfect day! Sure glad I didn't stay in bed this morning . . .